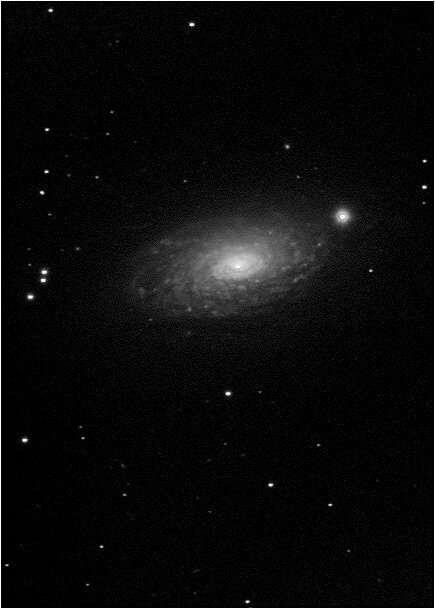 Situated in Canes Venatici the Sunflower Galaxy is surrounded by other wonderful objects, m51, m3, and the double alpha CVn mag +2.9 blue/white visual binary ( companion mag +5 ) , also known as Cor Caroli. Exposure 150 x 1 min unguided. Post-processing Dark & flat framed , cropped , stacked & mild DDP in AA3..
Clear cool night, slightly breezy , seeing 7/10. Just visible is a large dust lane spreading across the lower section of M63.